For driving the beat or adding a touch of syncopation, the Meinl Percussion Classic Hardwood Claves help you keep the music moving. Made from solid hardwood, the Classic Hardwood Claves give you timeless tone that works with any style of music. For professionals, claves give you a polyrhythm workout that builds your chops. For beginners and music educators, a set of claves is a great way to get students directly involved in making music from the first lesson - our instructors at Remix Music use claves in drum lessons and beginning music classes. So whether you're adding to your professional percussion rig or teaching the basics, you'll love the Meinl Percussion Classic Hardwood Claves. 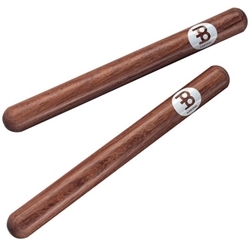 The Meinl Percussion Classic Hardwood Claves belong in your percussion kit!